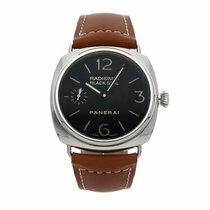 The Panerai Radiomir Black Seal is a comparatively affordable luxury watch from the Italian cult brand. Top models have a power reserve lasting up to eight days or are made of high-tech materials such as ceramic. 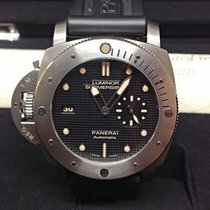 The Italian luxury watch manufacturer Panerai introduced the Radiomir Black Seal to the market in 2004. The "Black Seal" in its name refers to the nickname of Italian combat divers, who used Panerai timepieces in the 1930s and 40s. During their night dives, they wore black wetsuits, causing them to resemble seals. The "Radiomir" in the name comes from the radioactive luminous material of the same name, which was used until the late 1940s. You can recognize a Black Seal by the "Black Seal" inscription on its dial. Earlier models had this inscription above the six o'clock position, while more recent models feature it below 12 o'clock. How much does a Radiomir Black Seal cost? 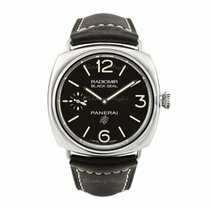 The Panerai Radiomir Black Seal from 2004 is a coveted yet affordable collector's watch. This model is available in very good condition for less than 4,000 euros. You can find it via its reference number, PAM00183, which is also used for more recent models. A new PAM00183 costs around 5,200 euros. The PAM00183 features a small seconds at nine o'clock and the so-called "sandwich dial," comprised of two discs. The bottom disc is luminous and the upper disc has cutouts in the shape of indices. One advantage of a sandwich dial is its strong luminescence. The timepiece also features a sapphire glass case back , giving you a view of the beautiful OP XI caliber, which is based on the ETA 6497-A2 movement. The movement has blued screws, a swan-neck fine adjustment, and a bridge with Geneva stripes. Unlike the PAM00183, the PAM00380 has a stainless steel case back, making it a bit heavier than its sibling. The 45-mm timepiece is powered by the caliber OP II, which is also based on the ETA 6497-A2. Its dial differs from that of the PAM00183 in that the Panerai logo is above six o'clock and it has a sausage dial in lieu of a sandwich dial. A sausage dial has raised hour markers and numbers that are painted with a luminous material. The small bumps from the raised markers create the look of a halved sausage, hence, a "sausage dial." 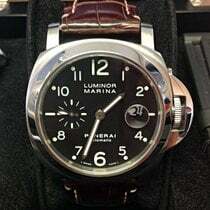 A new PAM00380 costs around 3,400 euros, making it a comparatively affordable Panerai timepiece. 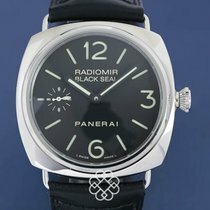 If you don't want to have to manually wind your watch every few days, then the Radiomir Black Seal 3 Days Automatic Acciaio (PAM00388) might be worth a look. The automatic in-house P.9000 caliber powers the timepiece and features a date display, unlike the manual calibers OP II and OP XI. The P.9000 has a power reserve lasting three days, and you can view the movement through the timepiece's sapphire glass case back. Like the PAM00183, the PAM00388 has a sandwich dial without a logo. Prices for a pre-owned PAM00388 start at around 4,600 euros. New, they cost about 5,000 euros. The Panerai Radiomir Black Seal is also available with a ceramic case. The high-tech material is lightweight, scratch-resistant, and mostly black. Ceramic models can be found under the reference number PAM00292. Like the PAM00183, the PAM00292 is powered by the manual caliber OP XI, which has a 56-hour power reserve. Thanks to its black design, the 45-mm watch appears somewhat smaller and more elegant than its stainless steel siblings. The manual movement enables the watch to be very thin, as well. The Radiomir Black Seal Ceramica makes a perfect everyday watch with its robust materials and classy look. You can purchase a PAM00292 in very good condition for around 4,700 euros. New, the timepiece costs around 6,000 euros. 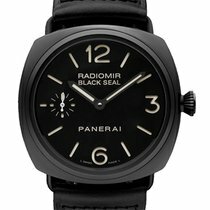 One highlight of the Radiomir collection is the Radiomir Composite Black Seal (PAM00505). This men's timepiece is unique because it's made of a special composite which combines the characteristics of aluminum and ceramic. Softer metals such as gold or stainless steel are difficult to break, while ceramic is incredibly hard and easier to break. Combining aluminum and ceramic makes the Composite Black Seal lightweight, scratch-resistant, and less prone to breaking. Panerai uses the automatic in-house P.9000 caliber with a date display to power this timepiece. A pre-owned PAM00505 costs at least 4,800 euros and a new model costs 6,300 euros. If a three-day power reserve on the automatic timepieces aren't enough, you should take a closer look at the Radiomir Black Seal 8 Days Acciaio. Thanks to its in-house caliber P.5000, the timepiece can run uninterrupted for 192 hours, or eight days, after it's fully wound. This powerful manual watch can be found via the reference number PAM00609 and costs around 4,500 euros new.